Beards look better on your face than they do in your aquarium! 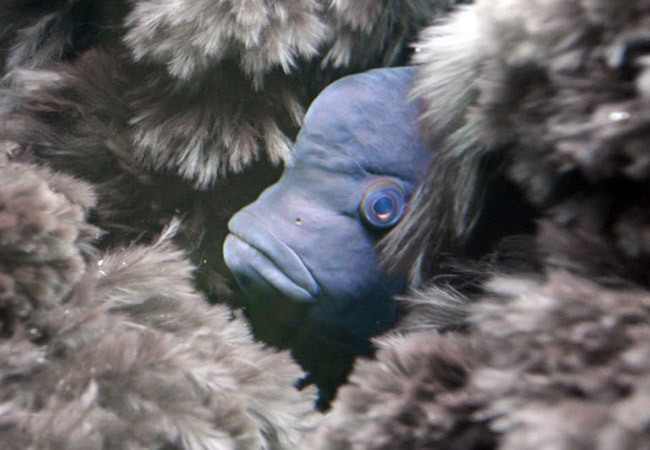 In an aquarium, it just looks like a fuzzy mess. I’m talking about black beard algae. The bearded monster that can quickly take over your tank. Today, I am going to show you how to identify it, get rid of it, and stop it from coming back! What is black beard algae and how to identify it? 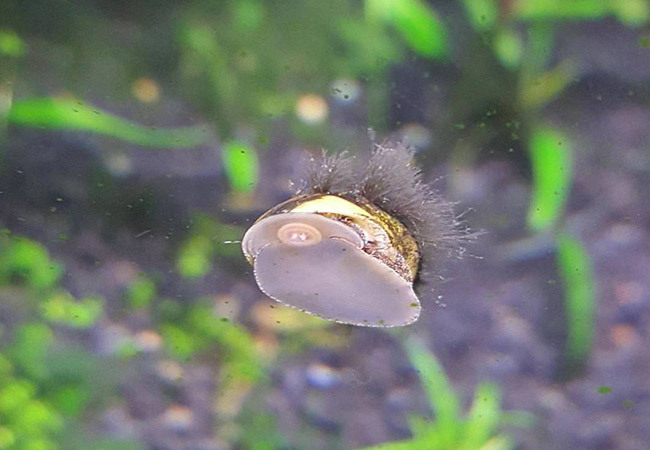 Is black beard algae harmful to fish? Is black beard algae harmful to plants? Do you need to remove black beard algae? What is the cause of black beard algae? How do you remove black beard algae? I love it when things are named after what they look like, and black beard algae is certainly that – a black algae that looks like a scruffy beard. It is also referred to by the name black brush algae or by the initials BBA. While black beard algae is considered to be a saltwater algae, there are strains that are common to freshwater tanks. In fact, in all my years of fishkeeping, I have probably seen more freshwater tanks become plagued by this bearded menace than saltwater ones. It may surprise you to learn that despite its name and look, black beard algae is actually a member of the red algae family. 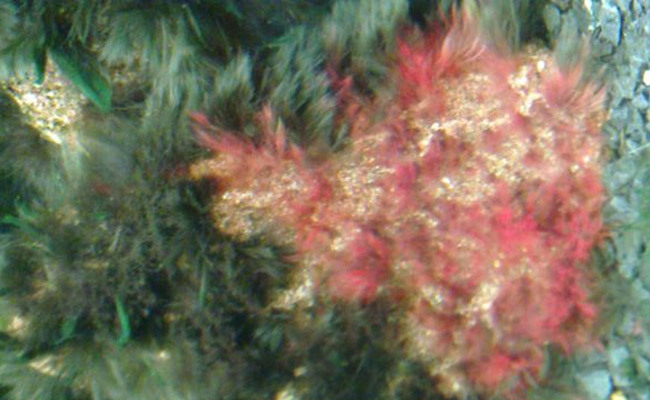 This shouldn’t surprise any of you who have killed black beard algae before – it turns a red color as it dies. However, when it is healthy, black beard algae’s color ranges from a dark green, browny gray to a deep black. While its color may vary, one thing remains constant – its look. Just like a beard, this algae starts out as light stubble – small spots of fuzz that cling to the surface of anything in your aquarium. But if left unattended, it soon grows into a glorious, thick and brushy, hair jungle. Seriously, it looks like hair straight out of a shampoo commercial! Even on the shell of your snail! My point is that black beard algae can grow anywhere. Decorations, rocks, even on the glass of your fish tank! Black beard algae is easiest to spot when it grows on plants. It typically grows on the edges of the leaves before expanding and covering them completely. Black beard algae is often confused with staghorn algae. 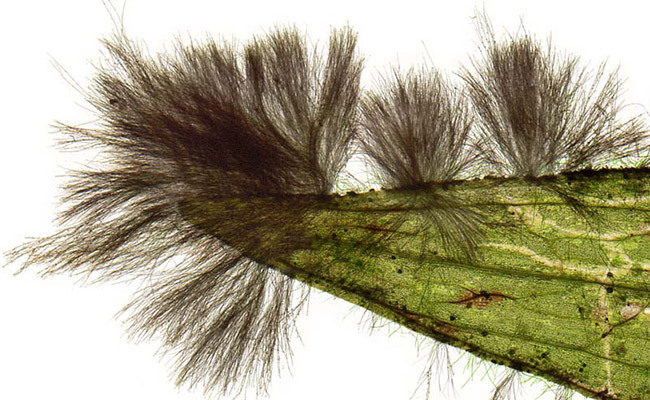 And, I can see why – fully grown staghorn algae looks much more like a wiry beard than black beard algae does. 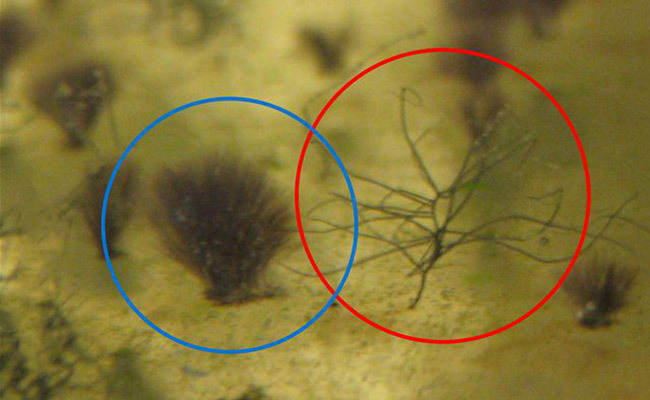 In the blue circle, you have black beard algae, resembling the tightly packed clusters of bristles you find on a makeup brush. Staghorn algae, circled in red, looks more like the antlers of a male deer – hence the name. When fully grown, the two also look quite different, but unless you compare them side by side, it’s easy to see where the confusion comes from. 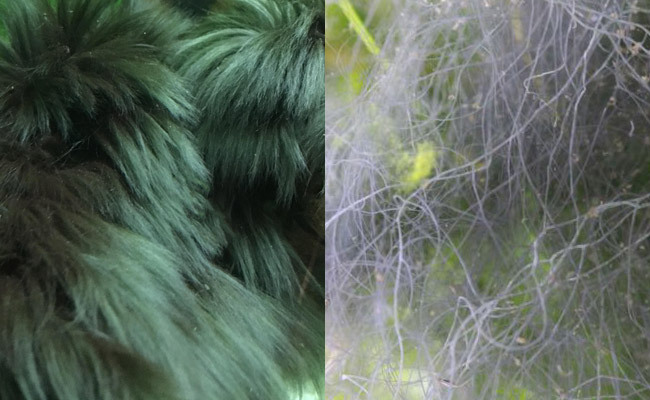 Fully grown black beard algae, on the left, is dense and bushy while staghorn algae, on the right, is sparse and wiry. For more information and pictures (and how to beat it), check out our in-depth staghorn algae guide. Nope, black algae is not dangerous to your fish. In fact, if you let your black hair algae grow, many fish happily swim and hide in the long flowing hairs. 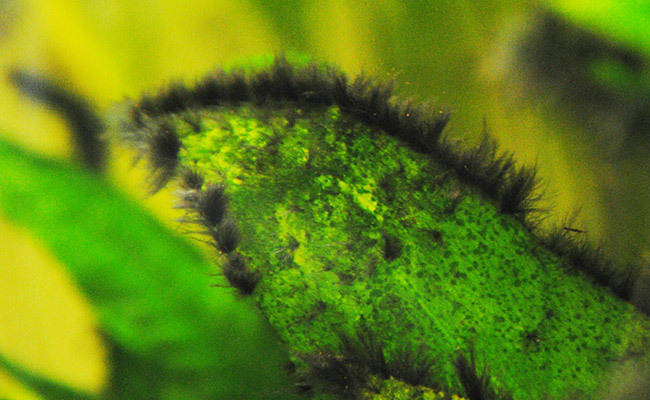 Let’s say that you notice black beard algae beginning to grow on the edges of one of your plants. No harm done. The problem is… As the algae begins to spread, it blocks out more and more light. And if you know about photosynthesis, you are fully aware that light is vital for most aquarium plants to survive. Without it, they die. So yes, an uncontrolled spread of black algae can be particularly dangerous to plants in your aquarium. For most beginners (and even some experts! 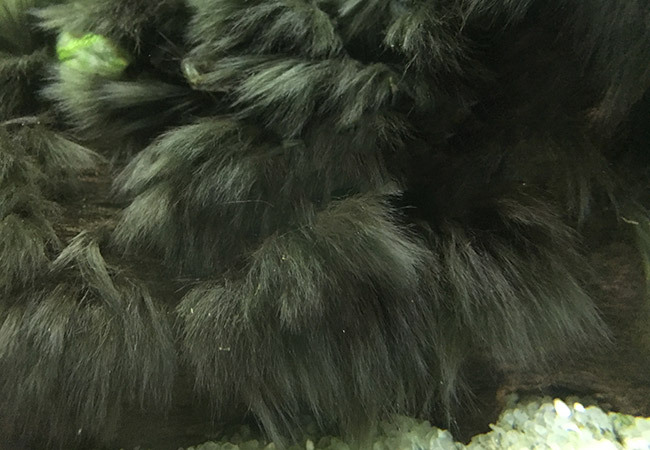 ), black beard algae appears when something isn’t quite right in your tank – creating the perfect environment for it to grow. If the cause isn’t fixed, black beard algae will continue spreading until it takes over your entire tank. You want this bearded menace gone, and you want it gone now! And, that’s just fine. 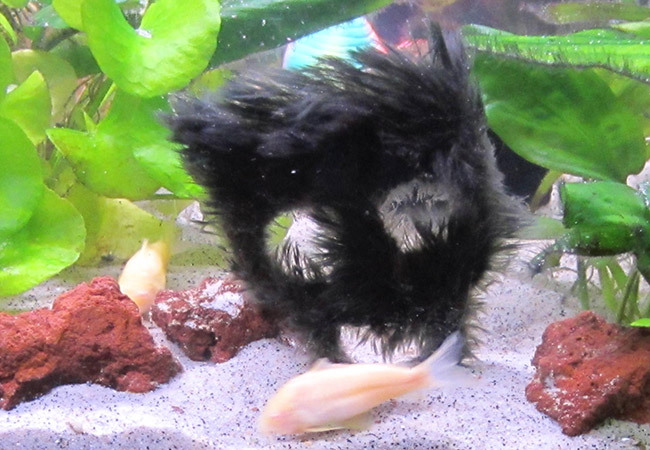 In fact, I would argue that the majority of hobbyists view black beard algae as an ugly menace that needs to be eliminated. However, there are some instances where black beard algae can be a welcome addition to your aquarium. Just keep in mind that those who encourage black beard algae are experienced and know what they are doing. It may surprise you to learn that some fish keepers voluntarily add black beard algae to their aquarium. Yep, what many people consider a pest can also become a beautiful plant when properly maintained. This fish keeper allowed black beard algae to completely cover a decoration in her aquarium, creating a spooky mask that moves in the water. The result is a lovely centerpiece that his fish love to hide in. As you see, if you know what you are doing, black beard algae isn’t always bad news! One day it isn’t there, then the next day it is. It feels like black beard algae magically appears on its own, right? Well, it may surprise you to learn that black beard algae needs a little help from you. Like most plants, algae requires certain conditions to thrive. 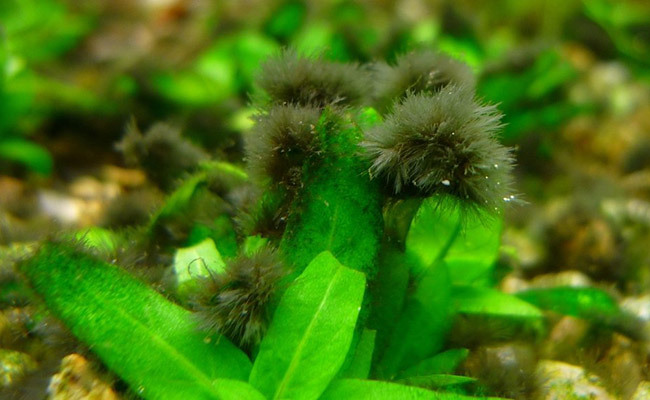 If these conditions are met, black beard algae spreads across your tank like wildfire. Well, underwater wildfire anyway. It is generally accepted that CO2 fluctuations are the number one cause of black beard algae. If your CO2 levels are too low, your CO2 is fluctuating or you have poor water circulation, you are creating an environment that is perfect for black beard algae to grow. If you have black beard algae, getting your CO2 levels in order should be your first priority. It could be your CO2 canister is running low, there is a blockage or you are not injecting the correct amount. Don’t run a CO2-injected tank? Your unstable CO2 levels could be a result of water changes – a large water change can significantly fluctuate the CO2 levels in your tank. If this is the case, and you have a planted tank, I highly recommend dosing with Seachem Flourish Excel. It is a simple additive that provides your plants with a source of carbon, and, as I will discuss later, can be used to effectively kill black beard algae. Like many algae, black beard algae loves light. The more light it has, the faster it spreads. This is a particular problem for those of you with planted tanks – that LED grow light isn’t just helping your plants to grow but algae too. If you leave your aquarium light on for long periods of time (or never turn it off), then you are basically encouraging algae to enter your aquarium. Reducing the amount of time that light shines on your aquarium can slow or even stop black beard algae from appearing altogether. I recommend using a reliable aquarium timer to automatically turn your LED lights on and off each day. It’s easier than manually doing it– something you will certainly forget to do. Check out our detailed guide on aquarium timers for more information, including which timer is best for your aquarium. Important: When removing black beard algae, never scrub or pick at it. Small pieces can float and settle on other plants or decorations in your aquarium, causing it to spread faster than before. Your black algae problem typically won’t go away on its own. Not without fixing the cause first – and even then, established algae in your tank will probably require a little effort on your part to banish it for good. 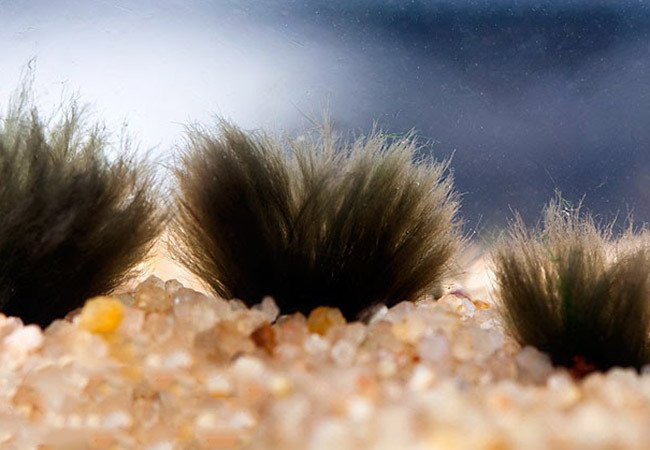 Use the tricks below to deliver the killing blow to the black beard algae in your aquarium. So, you want to make your black algae problem go away for good? This solution will only work if black beard algae has just begun to appear in small numbers on your plants. If black beard algae has already taken over your tank, skip to the next step. 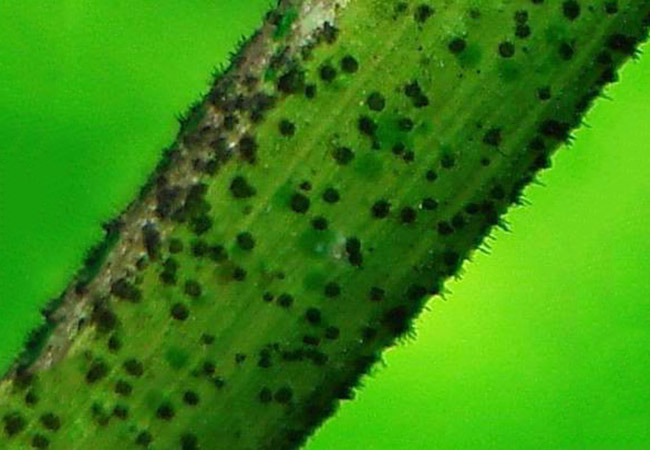 If you see the dreaded black fuzz growing on the edge of your plant leaves, simply cut the entire leaf off at the stem and remove it from your aquarium. However, a haircut alone will not save your tank – there are very likely other small pieces of black beard algae lurking in your tank, just waiting to make an appearance. This stuff is simply amazing for planted tanks! Not only does black beard algae hate it, but it will improve the growth of the other plants in your aquarium. This will be especially noticeable if you don’t already inject CO2. Using it is simple. Just follow the instructions. In my last tank, it took just a few days before I began to notice the black beard algae wither and die. Ensure that your water flow is adequate to deliver the Excel to every corner of your tank. If you don’t notice a change, double dosing may be required. Alternatively, you can try spot dosing. 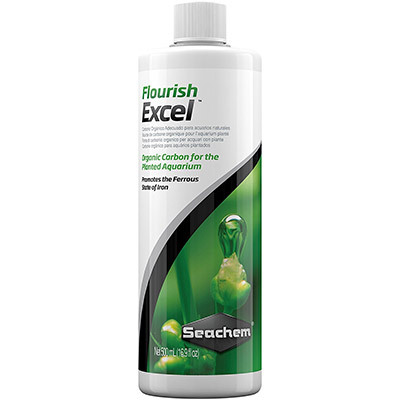 This involves using a pipette or syringe to apply Seachem Excel directly to the algae. Below is a quick video on just how effective spot treatment with Excel is! If you take this route, ask an expert about the amount of Excel you should use for each dose – the amount will vary according to the size of your tank and the number of fish that is stocked. Black beard algae often turns a red/pink as it starts to die before finally turning a clear, white color as it dies. This dramatic color change is actually very helpful because it’s obvious which areas you need to treat next! Wouldn’t it be great if you could just add a fish to your aquarium and have it take care of your black beard algae problem for you? The true Siamese algae eater. Black beard algae is just one of the many different algae that this fish eats. You see, there is no guarantee that this fish will eat the black beard algae in your tank. Like humans, fish have preferences to the type of food they eat, even among the same species. 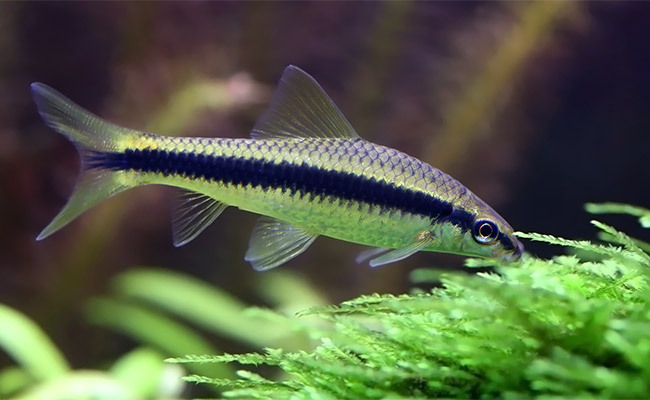 And even if your Siamese algae eater does have a taste for black beard algae, it might not be able to nibble the algae fast enough to completely remove it from your aquarium. This is also a common problem with shrimp. While they do eat black beard algae, they cannot eat it fast enough to make a noticeable difference. Check out the video below. 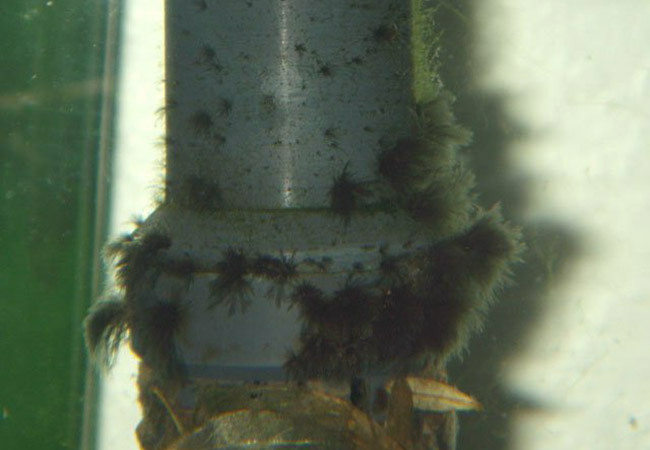 Despite the shrimp constantly chomping at black beard algae, they can’t keep it in check. If you want to stick to a proven method that works, and you don’t want an extra mouth to feed!, I recommend using the Seachem Flourish Excel dosing method. While it may not be harmful to fish, unwanted black beard algae can soon cover every corner of your tank – and to many, it looks darn ugly. However, by maintaining proper tank parameters, you should be able to prevent black beard algae from appearing in the first place. 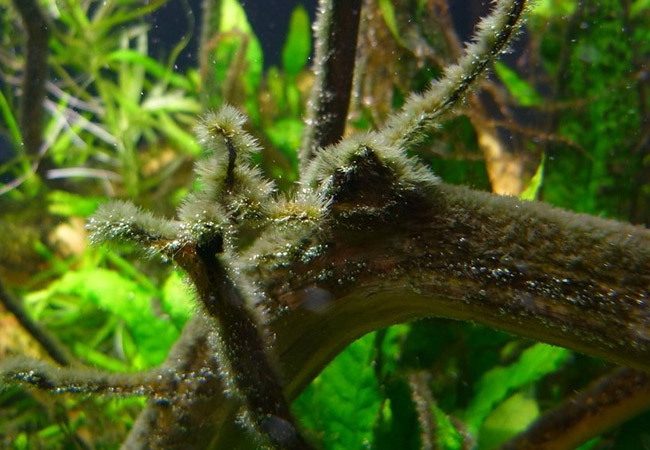 How did you get rid of black beard algae in your aquarium? Let me know in the comments below! Won’t reducing light hurt your plants? Don’t they need the light too? Plants do not need a full 24 hours of light. In nature, they only have the day/night cycle to go by, which leaves plenty of time for darkness. Fluctuating Co2 is a commonly mentioned thing for high tech tanks that have BBA. But what about low-tech tanks with BBA that don’t do water changes? On multiple times, I have fixed my BBA issue by removing dissolved organics. And that means removing detritus that builds up on the planted tank, and keeping the tank clean. For co2 injection, I do remove organics and also increase my co2 levels. If plants are getting too much light and little co2, then there’s gonna be a problem. I spray a bit of hydrogen peroxide to plants and that has worked as good or better than Seachem excel. I’d also use Siamese alage eaters and black mollies, depending on how bad the BBA is spread. Everyone should do good tank maintenance to avoid all sorts of alage problems. We have a 30 gallon community tank that was over run with BBA. Drove me nuts. Siamese algae eaters didn’t have a prayer of cleaning it up. We recently moved and the tank was shut down for the move. I through all the live plants out trying to stop from reintroducing BBA to the newly set up tank. I had heard boiling BBA kills it so after I cleaned all the gravel I boiled it all for a while. Do you figure this killed it. Now that I know about Seachem I am gonna get some and use it. Sorry to hear about your ordeal. It can be nasty stuff when it takes hold. While boiling the substrate will have killed the BBA attached to it, if the environment is setup for BBA to thrive, it will likely return. Killing BBA doesn’t fix the problem of it appearing in the first place. Say if there is a nutrient imbalance, it would be better to fix this first as it will deal with the cause rather than the affect. I’d test your water parameters and if everything seems normal, try removing the decoration and scrubbing it with a toothbrush and some hydrogen peroxide. Rinse and replace. Platys should be kept in small groups with a ratio of males to female fish. If this is skewed, it’s not uncommon for them to fight. I suggest reading up a little more on this since this is out of scope of this article. Would you recommend adding hydrogen peroxide directly into a 40 gallons tank that is infested with black agae? How much would you add? Unfortunately, I don’t make recommendations regarding Hydrogen Peroxide – I have seen too many beginners nuke their tanks with it. There are plenty of online guides to follow if you do want to go that route, but I generally only recommend it to people who have prior experience dosing it. I have a “white lobster” (crayfish) in my freshwater tank that has BBA growing on it and its antennas. Can I apply Flourish Excel directly onto my crayfish with a syringe? Will it hurt it? I wouldn’t do this at all. Are you able to manually remove it with a toothbrush? Unfortunately, I have no experience in removing algae directly from crustaceans. Really excellent article! So, I have some BBA growing on a rock (and tufts on some driftwood) where Christmas moss is just beginning to take hold. (Which was my intention) Do I need to get in there and remove the BBA or will the moss out compete it and effectively take over the rock and wood? It’s unlikely that the moss would “outcompete it,” especially if conditions are right for the BBA. If you want the moss to be the feature, you’ll have to remove the BBA completely. So, I have a 900 gallon stock tank with a LARGE Alligator Snapping a turtle in it who is covered in BBA. He will soon be going on display at a local zoo and while he looks cool all fuzzy with algae, I’d prefer to let his real beauty shine through. There is no substrate and I do weekly water changes in his outdoor pool. I’m thinking about trying the liquid carbon, but once the algae is killed, does the structure remain? It’s so well attached to his shell that I can’t remove it with scrubbing, and I’m afraid I’ll end up with white beard algae “carcass” covering him which would be worse than the current situation. Unfortunately my expertise covers fish, it doesn’t extend to reptiles. In this instance, I would suggest speaking to a vet or someone with more experience with keeping turtles. I wish I could be more help. Wow, turtles shed? That’s a lovely bit of trivia you taught me. Thanks so much for your expertise Cj! Hi. I’m not sure how old this article is as it doesn’t say. I’m kind of in the same boat. But with an added extra? I have a planted aquarium. The whole setup was running fine for weeks than within hours (over the course of one night) the gravel in my tank at the front and middle was all covered in small black fuzzy balls. I knew instantly it was algae. However there was none on the plants at all? The gravel was what it started growing on. Over a week I noticed it did start to slowly spread as in the balls were getting bigger and even merging. I added some Malaysian trumpet black snails to the tank and I know they don’t like constant light (which I had before I added them) the snails are mostly active in the dark so I turned the light off. Here is the snag. When I checked the next morning the same black fussy balls all turned green? Which makes me think and wonder is this actually black algae I have if so why turn green? However it makes sense now reading your comment on to much light. Everything in my aquarium seems happy enough. And the plants seem healthy. At the front of my tank iv also noticed one more solid looking black ball shaped thing under the gravel with long tentacle like things coming from it. I do agree with you the speed this stuff grows is astonishing. I will be keeping your tips on hand for the future if and when I ever need them. Thank you for taking the time to post a helpful article. If it changes to a green color in the absence of light, I don’t believe it to be BBA at all. Even after 24 hours of darkness, blackbeard algae I have witnessed keeps it’s dark color. I am actually a little unsure what you could be dealing with. I honestly wish I could help you further. I will add that using a day/night cycle can stop many types of algae from taking a hold and becoming established. The easiest solution is to use an automatic plug-in 24 hour timer and connect it to your tank lights. For artificial plants you could just remove them from the tank and give them a soak in water diluted with peroxide or bleach. Since you don’t have to be careful about killing the plant, this is probably the most effective treatment for BBA. Hi, really interested in you.saying to use bleach or hydrogen peroxide. Do you then just rinse it off and it doesnt hurt the fish? Also similarly in the other comment where you say to spray hydrogen peroxide when doing a water change as the hydrogen peroxide breaks down in the water. So would this be a total water change? or are you spraying the peroxide into the water? Are the fish still in the tank or do the fish come out for 48hrs….im very intrigued and would love to know as this algae is driving me nuts! Thank you. A bleach or Hydrogen Peroxide dip can be safely removed in fresh water. In fact, a bleach dip is often used on live plants prior to adding them to an aquarium – to help eliminate hitchhikers prior to adding them to your tank. Be mindful that a bleach solution can discolor some plants. As for liberally applying hydrogen peroxide to your tank, it’s a more advanced technique that is outside the scope of my site. The focus here is on beginner friendly solutions that can be implemented with minimal risk. There are plenty of guides and videos online that show how to treat with hydrogen peroxide if you want to research it further. You didn’t even mention the best method lol. Get yourself a spray bottle of hydrogen peroxide, when you do your water change in your tank, spray a medium amount of HP wherever the Black beard algae is. It will start to kill it almost immidiately and you will notice a difference within 24-48 hours. Hydrogen Peroxide eventually breaks down into just water so no need to worry about it harming your fish or plants. This guide is was written with beginners in mind and aims to keep things simple. I have seen beginners and experts alike accidentally nuke their tank by incorrectly using hydrogen peroxide. Your comment highlights this problem. What is a “medium” amount to you might be a small amount to someone else. If you are comfortable using HP, then go right ahead. I use it too, but I am always hesitant to recommend it to beginners. will this harm the shrimps ? Thanks for the article. I am battling this big time. I do co2 injection and have what the color solution indicator say is good co2 levels, have good and strong circulation in my 55 gallon fresh planted tank and had been dosing Flourish Excel daily with no results at all. Only light the tank 7 hours per day. The only thing that has worked for me is removing rock, wood, and filters parts etc and either using hydrogen peroxide or a diluted bleach solution for a few minutes which kill it. Any idea where my issue is given my water parameters for the fish read very good? Thank you! Unfortunately there is not enough information here to pinpoint the exact problem. It could be as simple as a small amount hitchhiked it’s way in and it has overgrown from there. Spot treating with either flourish excel or hydrogen peroxide will work better for stubborn cases of black beard algae rather than just dosing the water. I have a similar situation as above, I have what is definitely BBA growing on my pants and on one of my rocks. On the rock and threads that used to hold a long forgotten plant it looks lovely, but it is a problem for the plants. I also have an identical looking algae growing on my bogwood but in a really beautiful green. Would you recommend spot treatment on the plants to try to save the attractive species of algae or is it likely to kill it all indiscriminately anyway? If you are really careful, spot treatment should only kill BBA in the area that it is applied. If you really want to keep it as a decoration, I’d start by using a really small dose and seeing how it reacts – you can always up the quantity if you need. Just be mindful that it’s possible that, over time, your BBA will spread again to your plants. If this happens you will need to spot treat again. I am currently battling an algae issue It looks like BBA,, but it is grayish white and spreading like crazy. Are you sure it isn’t biofilm? Regarding SAE, I’ve had great results with them but only as younger fish. They tend to develop a taste for a prefer general food you feed your other fishalf as they age. Thanks for the feedback. That’s very interesting and even more reason not to recommend them – I’d prefer to care for a different fish than an algae eater that won’t eat algae. My algae behaves like black beard algae, but it’s green; so it doesn’t look like black beard algae or staghorn algae. Can I use the same methods to get rid of my green hair algae? If it’s green, it isn’t black beard or staghorn. As long as you are not confusing it with blue-green algae then it’s most likely green fuzz algae or green hair algae. These algaes generally appears when their is a nutrient imbalance (too much light, co2, etc.) So the first thing to do is to check your water parameters. This algae can be scrubbed off however, if you don’t get your water parameters under control, it will be back. Thank you for such an informative article on this nuisance. I have never encountered beard algae in my 40+ years of fish keeping, until now. I followed your instructions and now have it under control. It’s funny how these things just kind of sneak up on you, right? 40 years without even a glimpse. Then, POW… Black Beard Algae! I’m glad to hear you found success with it’s removal. Great article, and all too familiar with our situation. This stuff is a nightmare! We are battling it as I write this. We have used Excel, H2O2, and mechanical removal methods and are slowly winning the battle. We are documenting the process in hopes that it will help others to not make the same mistakes we did. We even went as far as creating a new blog site and videos of the process. It can be pretty devastating when you put your heart (and lots of money) into a scape just to have the aesthetics ruined by this vile plague. SAE’s. I forgot about those. I will be visiting our LFS in the next couple of days. Thanks again for taking the time to write this post! Thanks for the insightful reply. I’d personally skip the SAE as there is no guarantee they will chow down on the stuff. I would love to read your blog though, to learn more about your battle! Thanks for the advice on the SAE. 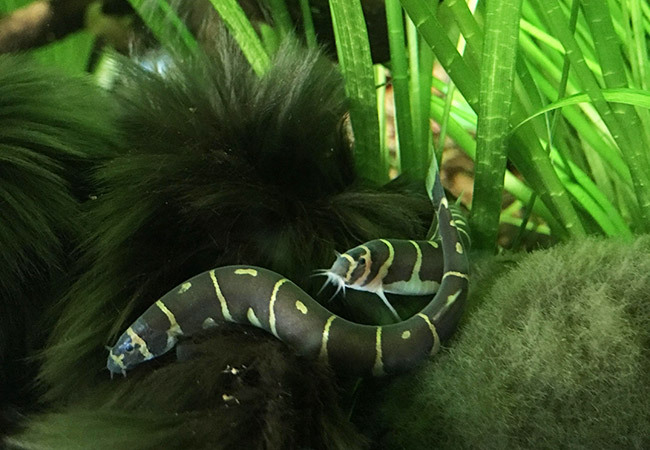 I was definitely going to head out today and purchase one or two of these guys being that I am willing to try anything to eradicate the remainder of the BBA in my scape. I think I’ll hold out and treat the issue in other ways so I don’t have species of fish I don’t really want in my tank. Wow, I’m not sure I would be game enough to try a 50/50 combo of hydrogen peroxide and flourish excel, especially with no guidelines except “spray everything covered in black beard algae” – it sounds like a nuclear bomb. I understand why you tried though, and I’m sorry to hear about the loss of your fish. I hope you win your battle! Sounds like a good idea on the SAE. In my opinion, if it’s not going to eat your algae, then it isn’t a particularly exciting fish. There are plenty of other freshwater fish that I would prefer. I used flourish excel on a shrimp tank and I had 90 percent shrimp death so I discontinued. Then I read that liquid carbon can be harmful to some invertebrates like crystal red shrimp. I can’t figure out any other alternative methods to eliminate BBA. So frustrating.